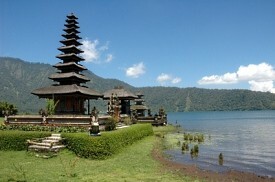 Bali is an intriguing island of lush vegetation, volcanic lakes, dense jungles, ancient temples and creative artists. The best shore excursions are full-day tours that stop at the Mother Temple of Besakih, the village of Klungklung for wood and bone carvings, the village of Ubud for paintings, the village of Mas for woodcarvings and the village of Celuk for gold and silver works. Pre- and post-cruise packages are usually offered here.